To Market, To Market with San Diego Foodstuff: See Ya, 2015! As we say so long to 2015, there are close to a dozen local chefs whom I'd like to thank for welcoming me into their kitchens and teaching me some of their best and favorite dishes, which I, in turn, shared with you here. These kitchen experiences are my favorite part of my food writing. I learn not just a recipe, but about the chefs themselves. These are people who love to share their passion. I get family stories, lessons in technique, a lot of laughs, and delicious food. It's also a way for me to gather knowledge about chefs, restaurants, and dishes that help me write stories for media like The San Diego Union-Tribune and Edible San Diego. It's a rich way to live and I truly am appreciative. So, thank you to Chef Ozvaldo Blackaller of Cueva Bar on Adams Ave., who taught me how to make beautiful empanadas wrapped in house-made flour tortillas: chicken with gorgonzola, brisket and sautéed onions, and chorizo with smashed potatoes. 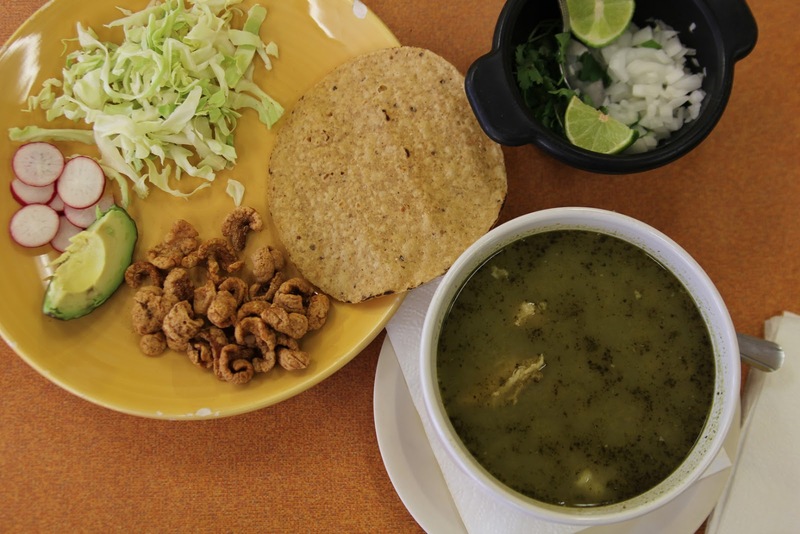 Many thanks to Rodnia Novarro and her talented mom, Rosario Sotello of El Borrego, for introducing me to their stunning green pork pozole, or Pozole Verde Guerrerense. As I write this on Sunday morning, it's a surprising 35 degrees outside and I could use a steaming bowl about now. 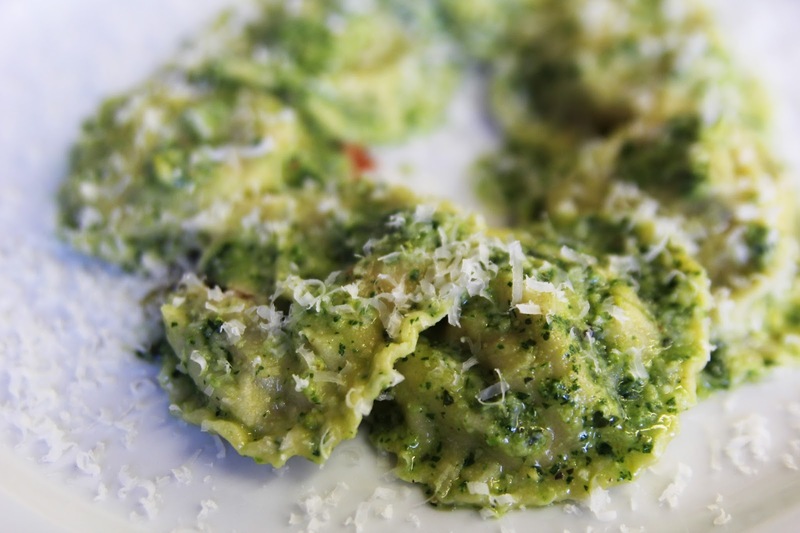 Ryan Studebaker, not only did you teach me how to make your beautiful Raviolini with Seasonal Vegetables, Pistachio Pesto, and Parmesan, you offered me some truly useful tips for how to sauté vegetables more effectively. Cheers to you and MIHO Experience! Nick Brune of Eco Caters and formerly with the now closed Local Habit is one of those cool guys who is passionate about collaborating with and promoting San Diego's culinary and musical talent. Local Habit hosted a fried chicken competition earlier this year and Nick travels around town with his Soundbite dinners, for which he brings in musicians to play songs with a connection to each dish. His Asian-influenced Cali-Creole cuisine resulted in this decadent Creole Noodle Soup. You could say in this bowl gumbo meets ramen. 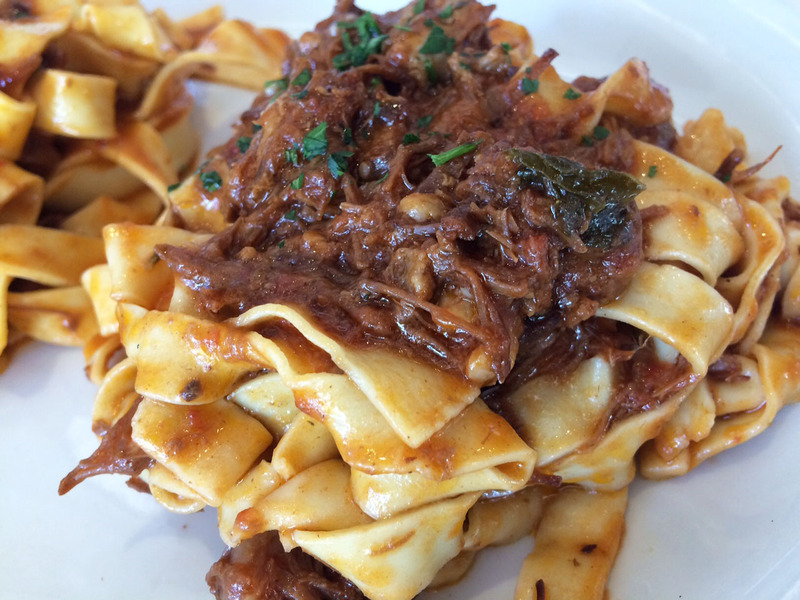 I love his dark roux noodles! 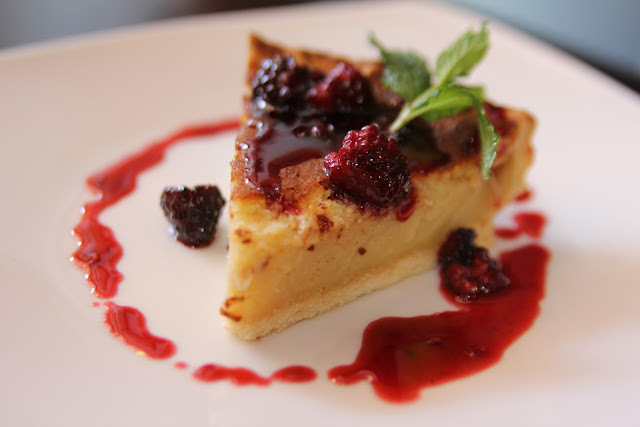 And, I loved the sweet finish to the meal: Nick's take on classic Southern Buttermilk Pie. Thanks, Nick! Thank you, Kurt Metzger! We miss Kitchen 4140 and are looking forward to your next venture. 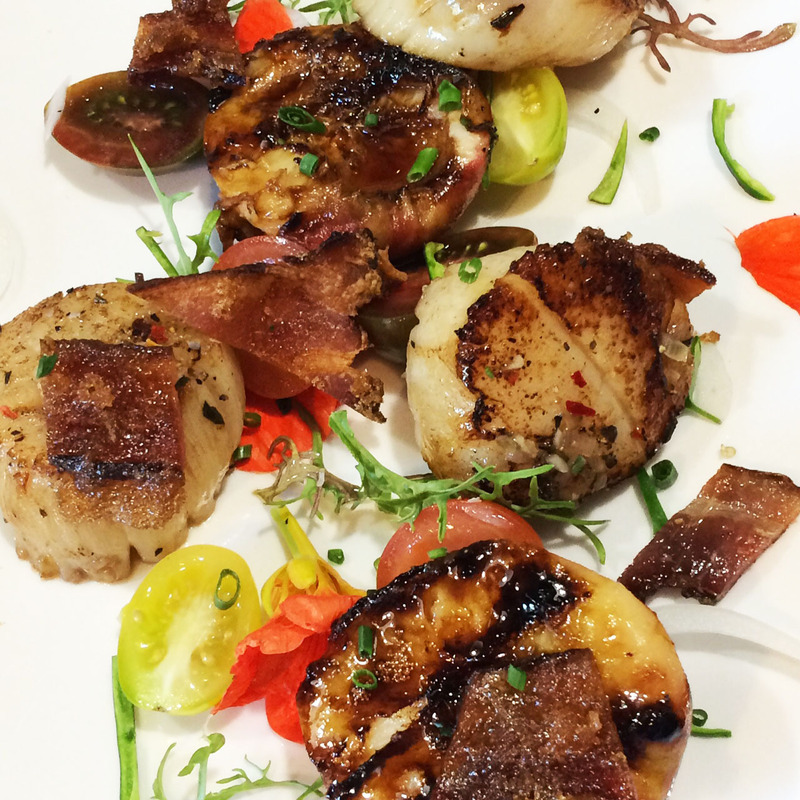 I appreciate your teaching me how to make this stunning Seared Day Boat Scallops with Grilled Peaches, Candied Bacon, and Micro Salad. I could not believe how many flavors could pop in one bite! Mille grazie to Fabrizio Cavallini of Monello and Bencotto for introducing me to your traditional Milanese technique for making pasta. It was beautiful to watch and not hard to replicate--with a lot of practice! Love your imported organic pastas, too! Accursio Lota of Solare taught me the Sicilian style of making risotto--two ways. 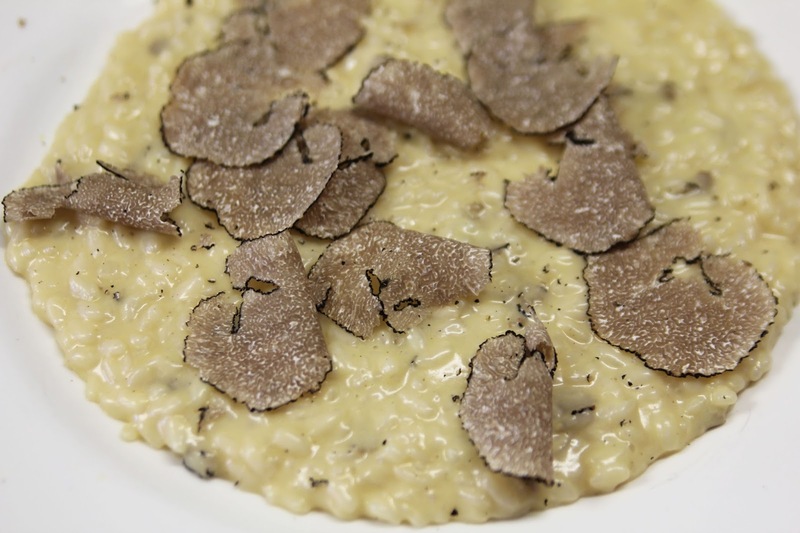 My friend Robin Ross of Cupcakes Squared and I learned how to prepare both his Risotto with Sardinian Saffron and his Risotto with Summer Truffles. 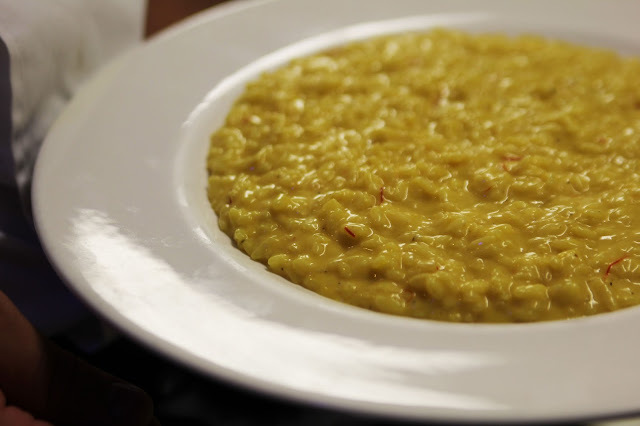 Plus, Accursio schooled us on the difference between rice varieties and its importance in making this creamy dish. Thank you! The following month, I took a virtual trip to the Philippines, courtesy of chef Evan Cruz of Arterra and his family, who run JNC Pinoy Food Mart in Chula Vista. His delightful grandmother, Rosario Cruz, demonstrated how she prepares a childhood favorite, Turon. Think sweet lumpia--with plantain, jack fruit, and sugar rolled in a lumpia wrapped, fried, then drenched in caramel. Oy! Thank you, Evan and Rosario! Thank you, Vince Schofield, for introducing me to the wild and wacky world of gooseneck barnacles. 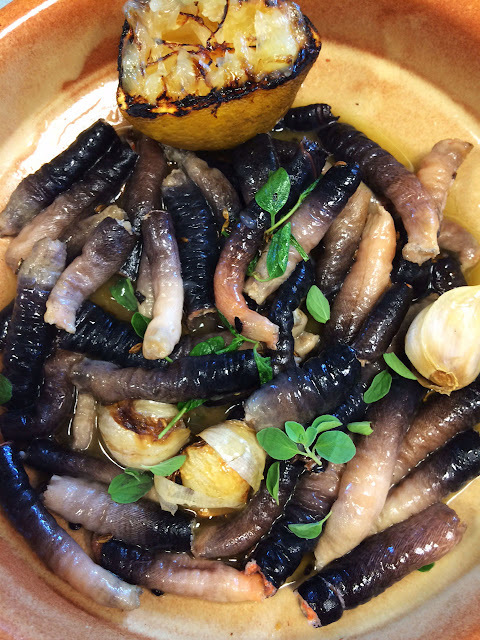 You've got to go to Catania in La Jolla to try his Sautéed Gooseneck Barnacles when they're on the menu--or make them at home with this recipe. They're so unusual--and so tasty! Bradrick Cooper, you just rock! I love your food at Coop's West Texas Barbecue in Lemon Grove and can't wait for you to open your fried chicken eatery! 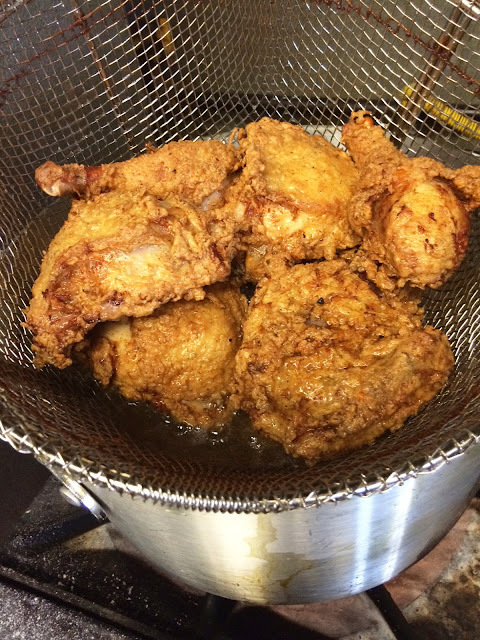 In the meantime, thank you for teaching me how to make your oh-so-crispy buttermilk fried chicken, which made you the winner of this year's inaugural Fried Chicken Challenge at Local Habit. It's totally addictive! And thank you to Steven Riemer of Oceana Coastal Kitchen at the Catamaran in Pacific Beach, who taught me not one or two ways to make ceviche, but three: shrimp, scallop, and seabass. And who also introduced me to the house-made tortilla chips that accompany them. Dangerous! 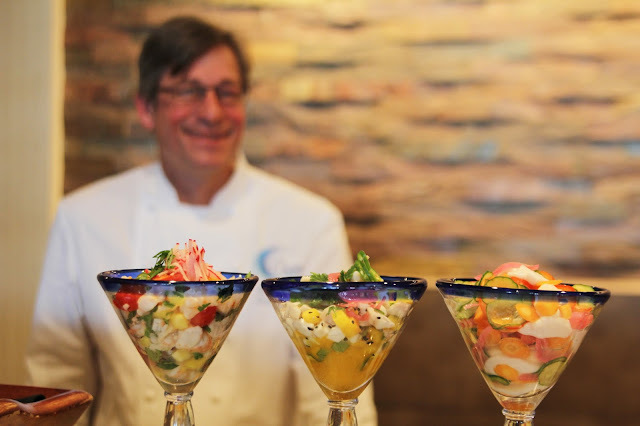 I appreciate your ceviche techniques and advice. No more runny ceviche! I also want to thank Bob Harrington and Specialty Produce for supporting my work both on San Diego Foodstuff and my Edible San Diego blog, Close to the Source. I so appreciate all you do in our food community and the larger San Diego community. You are a smart businessman with a big heart. Thanks to Tommy Gomes and the Catalina Offshore Products crew for always inviting me in to try something new and encouraging my seafood forays. You, too, are community gems! And, thank you to the market managers, farmers, and vendors I've visited with this year, who so graciously introduced me to what they make and sell--and so patiently answered my questions. 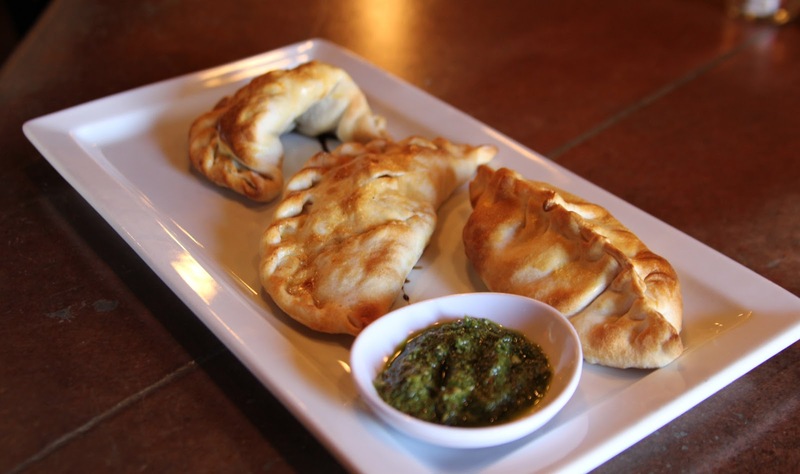 You--and our chefs--are the folks who are shaping the ever-expanding and maturing food scene in San Diego. It's been inspiring to spend time with you this year! Finally, thank you to my readers. I am grateful to have you check in weekly, subscribe to my e-newsletter, and follow me on social media. In February, San Diego Foodstuff will begin its ninth year. It's evolved from covering local markets to pretty much anything food-related in our region, including my kitchen experiences. If you have ideas for other news and information I can cover here, let me know! Please subscribe to the blog and newsletter--and leave feedback in the form of comments! I want to hear from you! Here's to a delicious 2016! May you all have a happy, healthy, and prosperous New Year!